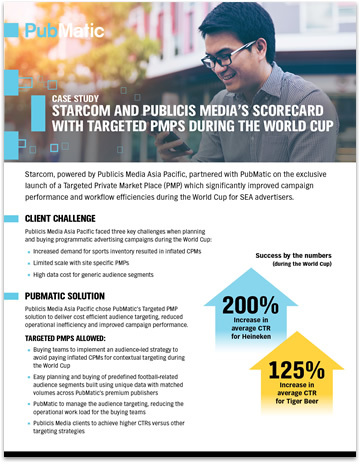 Starcom, powered by Publicis Media Asia Pacific, partnered with PubMatic on the exclusive launch of a Targeted Private Marketplace (PMP) for Southeast Asia advertisers during the World Cup. The Targeted PMPs resulted in triple digit CTR growth for two global beer brands, Heineken and Tiger Beer. PubMatic’s Targeted PMP solution delivered cost efficient audience targeting, reduced operational inefficiency and improved campaign performance. Learn how Publicis Media was able to improve campaign performance and workflow efficiencies with Targeted PMPs in this case study.